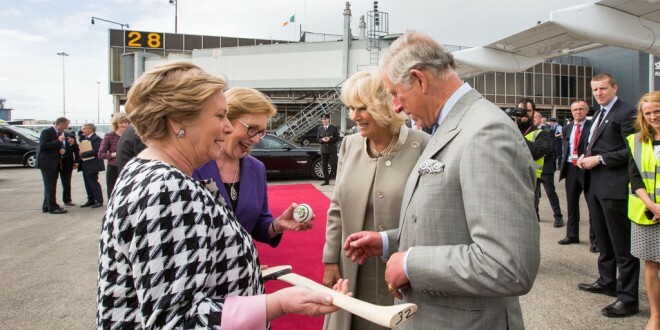 PRINCE Charles departed Shannon Airport this morning following his and the Duchess of Cornwall Camilla Parker Bowles’ visit to the West of Ireland expressing his delight with the two days. Boarding the jet for Belfast at Shannon, Prince Charles uttered three words that summed up his experience: “special, very special,” he stated. On hand to greet Prince Charles before his departure were Minister for Justice and Equality Frances Fitzgerald, Education Minister Jan O’Sullivan, Shannon Group Chairman Rose Hynes, Shannon Group CEO Neil Pakey, Irish Ambassador to the UK Dan Mulhall and Clare County Council Deputy Mayor Joe Cooney. Education Minister Jan O’Sullivan said that the visit had very much turned thoughts away from the past and to the future. “I think anyone who watched this trip closely or even from afar will have got a real sense that the Prince of Wales and Duchess of Cornwall genuinely enjoyed themselves. Today, as they departed, it was obvious that that was, indeed, the case.